By Craig Seger, P.E., and Matthew Stovall, P.E. 1. An overview of the dam embankment protection problem. 2. Why ACBs can be an effective way to protect embankments from overtopping flows. 3. An overview of the publications that detail the ACB design process, an examination of the calculations involved and how to make an appropriate block selection. 4. An overview of the applicable ASTM International standards that relate to materials, manufacturing, installation, testing and interpretation of testing results. In the United States, many dams were constructed starting in the early 1900s. As a matter of course, the more dams that were built, the more dam failures occurred. After the 1928 St. Francis dam failure in California that killed more than 400 people, legislation controlling dam construction and inspection was strengthened. And after a string of failures in the 1970s, President Jimmy Carter started the “Phase I Inspection Program” that directed the U.S. Army Corps of Engineers (USACE) to inspect non-federal high-hazard dams, which led to the Dam Safety Program. To better document the problem, the Association of State Dam Safety Officials (ASDSO) compiled a list of dam failures dating back to 1869, showing the cause, estimated damages and associated fatalities. The National Weather Service assembled a map based on the ASDSO list, which provides a quick view of where and when dam failures occurred. The National Performance of Dams Program (NPDP) at Stanford University compiled a chart summarizing dam failures from 1975-2001. Overtopping events are, by far, the leading cause (greater than 70 percent). More than 84,000 dams of all shapes and sizes currently exist in the United States, in varying conditions. Although most are in good repair, the 2013 American Society of Civil Engineers (ASCE) Report Card for America’s Infrastructure gave dams an overall grade of D. The report estimated that the number of deficient dams is more than 4,000, including 2,000 deficient high-hazard dams. (Dams are classified according to their hazard potential or consequences of failure; a high-hazard dam has the potential to cause loss of life in the event of failure, while a significant-hazard dam may cause heavy economic loss. Dams that do not meet the threshold for either of these two categories are low-hazard dams.) Improvements to the embankments of these deficient dams is necessary; designers are compelled to find economical and relatively simple ways to accomplish this task. Theodore Roosevelt said, “Do what you can, with what you have, where you are.” This attitude permeates the ASDSO, USACE, communities who own dams, and consultants who take responsibility for design, maintenance, inspection and repair. ACB revetment mats represent an opportunity to economically improve what these groups can do in terms of embankment protection; each stakeholder can potentially do more, in their locations, by reducing the cost to improve each embankment. When water impounded in a reservoir passes over a dam embankment due to reservoir capacity exceedance, it’s considered an overtopping event. The potential for rapid erosion of the embankment face is very high during an overtopping flow. These embankments, however, may be protected against soil erosion from such overtopping events by the use of an ACB revetment system, which has proven to be an aesthetic and functional alternative to dumped stone riprap, gabions, structural concrete and other heavy-duty erosion protection systems. 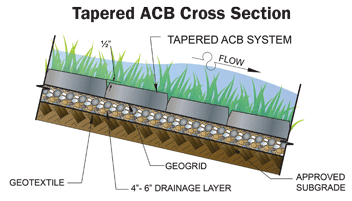 ACB revetment mats are flexible, interlocking matrices of cellular concrete blocks of uniform size, shape and weight, and they’re used for hard armor erosion control. 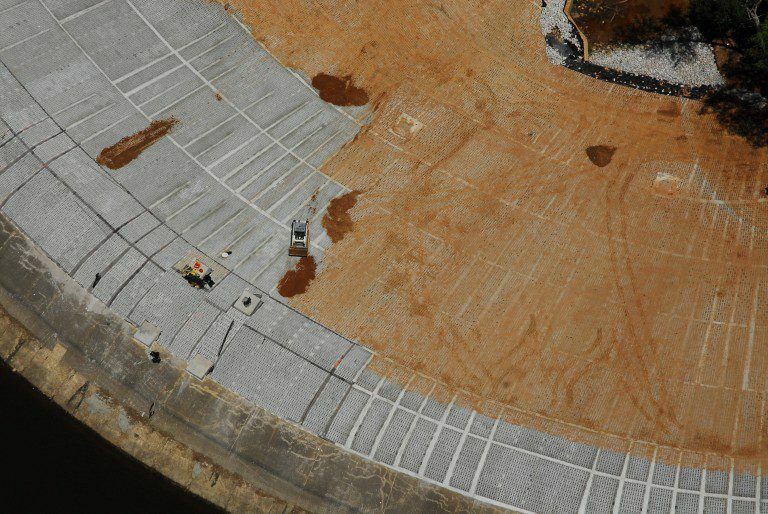 Typically, the protection system includes a site specific geotextile placed directly on the smooth, well-compacted subgrade, free of large lumps, rocks, and organic material. 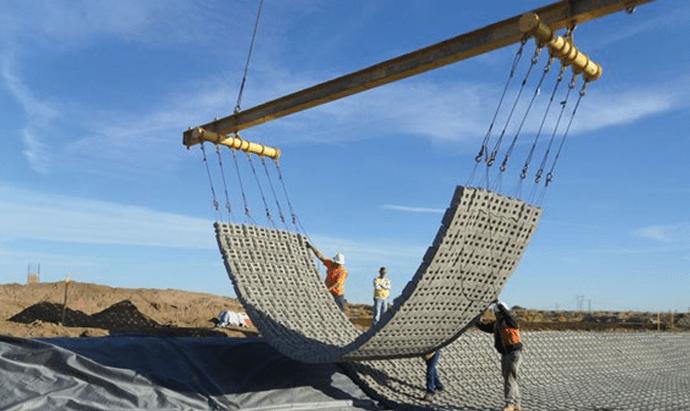 This geotextile serves as the primary erosion-prevention material, but since it alone is unable to withstand the rapidly flowing overtopping water, ACBs act to anchor the geotextile and hold it in place as well as provide a robust, hydraulically conducive surface to convey flows. Figure 1. Typical ACB cross sections. For particularly robust flows on steep planes such as dam embankments, some manufacturers produce a “tapered” block that will remain more stable under greater flows than standard blocks. For such systems, an additional layer of free-draining angular gravel, 4-6 inches thick, is placed above the geotextile and below the ACB. This drainage layer serves as an intermediate zone between the high-velocity, lower-pressure flow zone above the ACB surface and the low-velocity, higher-pressure flow zone within the subgrade. Typical cross sections for standard and tapered ACBs are shown in Figure 1. ACBs have specific hydraulic capacities—substantiated by standardized ASTM testing—that are used in design. The blocks may be solid (i.e., “closed cell”) or have openings (i.e., “open cell”). Products with open cells—when backfilled with gravel or soil—may allow for vegetative growth, greater infiltration/exfiltration capacity or (in applications subject to vehicular loads) greater traction. Individual blocks are laced into mats with cables to facilitate comparatively rapid installation; beyond installation, the contribution of cables to the overall hydraulic stability of an installation can’t be quantified and is conservatively assumed to be negligible. Although designers sometimes use cable loops to attach mats together or to earth anchors or other structures, the cables are intended as an installation aid. Photo 1. ACB mat installation by a crane using a spreader bar. The term “articulating” refers to the ability of the matrix to conform to minor changes in the subgrade while remaining interconnected with geometric interlock. This allows maintenance personnel to readily observe incipient subgrade issues, should any develop, which can be corrected quickly and at comparatively little cost. Mats typically are assembled at the manufacturing plant and delivered to a site on flat-bed trucks. Depending on the weight, each load can contain numerous mats. Mat installation generally requires use of a spreader bar, which many manufacturers will provide at a nominal rental fee. Photo 1 depicts installation of a mat using such a bar. Understanding the types of flow that exist during an overtopping event is crucial to designing an appropriate embankment protection system using ACBs. Figure 2. Typical hydraulic conditions during embankment overtopping. Without embankment-protection design, overtopping water will flow through four velocity zones and develop enough energy to cause erosion. Figure 2 shows and describes the zones. 1. Subcritical flow moves from static energy in the reservoir to increasing velocity and decreasing depth over the embankment crest. 2. Supercritical flow starts at critical depth, on the downstream slope, increasing in velocity and decreasing in depth. 3. Supercritical flow reaches a constant velocity and depth, known as “normal depth,” which is the design condition for ACBs unless modeled conditions show a lesser design condition may be applied. All these flow conditions can be expected to occur on most dam embankments, so the normal depth design condition generally is justified, assuming the embankment face is long enough to achieve it. If a design model reliably shows a lesser flow condition is governing, that condition may be used in lieu of the normal depth assumption. ACB protection design is a function of the embankment geometry, design overtopping volumetric flow rate and the characteristics of the material used to build an embankment structure. After this hydraulic, geometric and geotechnical data is gathered for a site, a designer can prescribe specific performance criteria for the embankment and require a minimum Factor of Safety for the given flows. To obtain these performance criteria, a designer can carry out a Factor of Safety calculation for specific ACB products as long as specific geometric and hydraulic characteristics of the product are known. Knowledgeable ACB manufacturers will provide this information upon request, and they may be able to help carry out design calculations. 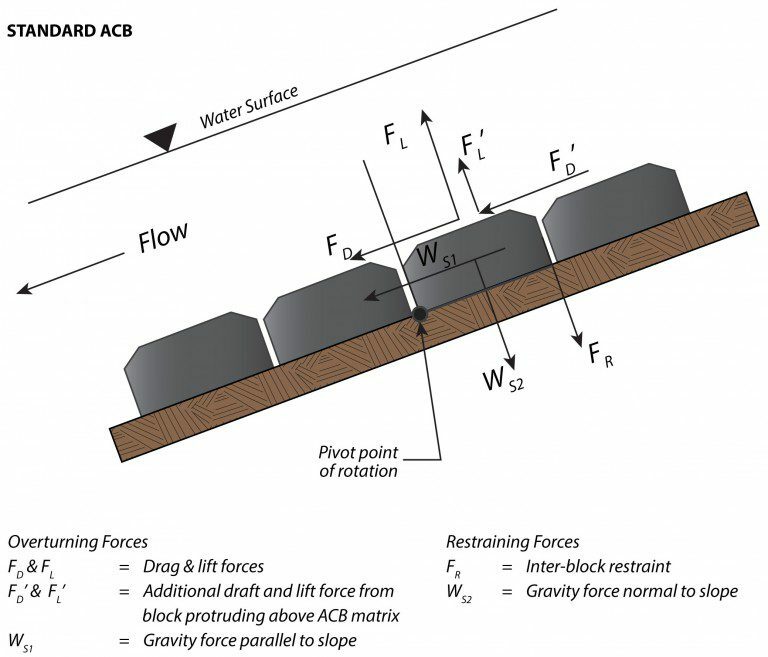 Current ACB design involves identifying a design overtopping volumetric flow rate and then selecting an ACB system that protects the embankment structures against erosion resulting from that design flow with a defined additional margin: the Factor of Safety. Typically, this target Factor of Safety is selected as an arbitrary value (2 is common) or defined according to qualitative factors such as consequences of failure and quality of design flow data. Figure 3. Moment Balance on ACB at Incipient Failure (TEK 2002). 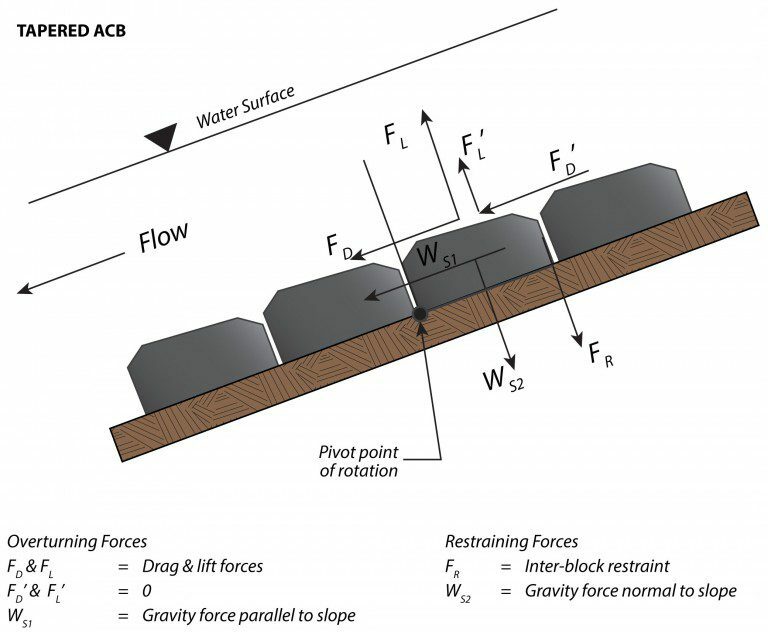 ACB design uses a “discrete particle” approach that involves the balance between overturning forces imparted by moving water and the stabilizing forces of an ACB block (HEC 23, TEK 2002). The discrete particle approach is based on the “Factor of Safety” derivation method for determining the point of incipient particle motion in a streambed (Julien 2010). The forces involved in this balance are depicted in Figure 3. Many publications guide designers to an appropriate block selection. The Hydraulic Engineering Center (HEC) publication 23 includes a variety of scour mitigation design guidelines, and “Design Guideline 8” in particular outlines the method of selecting and calculating the Factor of Safety for a given ACB system (HEC 23). This method also is outlined in more detail in the National Concrete Masonry Association (NCMA) “Design Manual for Articulating Concrete Block (ACB) Revetment Systems” (NCMA 2011). 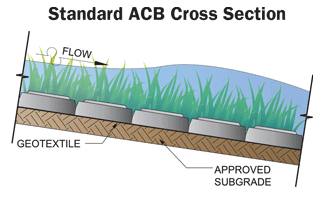 The NCMA also issued “ACB Revetment Design—Factor of Safety Method TEK 11-12A,” a later extension of this method that incorporated the possibility of oblique flows over ACB systems (TEK 2011). Finally, the “Technical Manual: Overtopping Protection for Dams” issued by the Federal Emergency Management Agency (FEMA) addresses a historical perspective, construction considerations, and details maintenance and inspection of ACB systems (FEMA 2014). A recent paper authored by Dr. Amanda Cox (Cox et al 2013), a former Ph.D. candidate at Colorado State University, further refines this design approach by quantifying the lift and drag forces on the ACBs directly to eliminate the assumption that these two forces are effectively equal and small by comparison to other forces acting on the block. This is particularly applicable to comparatively steep channel/embankment bed slopes. Most current designs now incorporate this quantification of lift and drag. Finally, design of an embankment protection system should consider edge treatment. The perimeter of the ACB system must be anchored in termination trenches to avoid undermining from scouring flows at these locations. Most manufacturers will provide details for selected products on request for incorporation into design plans as needed. Because this additional material is crucial to the performance of an installation, designers are encouraged to include this area in their material estimates as well as add language in the specification that specifically includes these “buried” portions in the pay limits. After selecting an ACB system for embankment protection, the designer also must understand the ASTM standards that apply to testing the block mat system and interpreting the testing results. This is particularly important to ensure that proper design input values are utilized. In calculating the Factor of Safety of a particular ACB system, in addition to the block’s geometric and physical properties, another parameter is needed: the Critical Shear Stress at 0°, which can only be properly determined by full-scale hydraulic testing. Tests to determine this factor were pioneered by the Federal Highway Administration (FHWA) in the late 1980s, and were later formalized and clarified in ASTM D7277, the “Standard Test Method for Performance Testing of Articulating Concrete Block (ACB) Systems for Hydraulic Stability in Open Channel Flow.” This was developed to standardize testing used in prior FHWA investigations in 1988 and 1989. ACB testing that conforms to ASTM D7277 will produce data that serve as the design input for the tested block: the Critical Shear Stress at 0°. Without this parameter, calculating a Factor of Safety is not possible. In fact, FEMA indicates that “product performance in overtopping or high-velocity flow conditions down steep slopes varies significantly. Only products that have been tested in like conditions of the design application with flume or field test conditions should be considered for use” (FEMA 2014). Furthermore, guidance for interpreting the results of standardized testing is outlined in ASTM D7276, “Standard Guide for Analysis and Interpretation of Test Data for Articulating Concrete Block (ACB) Revetment Systems in Open Channel Flow.” Together, ASTM D7277 and D7276 form a definitive methodology to determine the Critical Shear Stress at 0°. This is then used as the basis for project specific Factor of Safety calculations. In general, ASTM D7277 prescribes the requirements of testing. Specifically, it defines flume width, length, slope, soil parameters and flow durations for the increasing target overtopping depths. This standard also provides the criterion for failure, which is “loss of intimate contact with the subgrade soils” (for tapered systems, this applies to the contact between the block and the drainage layer). ASTM D7276 prescribes the methods of analysis and interpretation of hydraulic test data, including how to determine a design Manning’s n coefficient, shear and velocity threshold values, and the Critical Shear Stress. Designers are encouraged to specify that ACB systems be shown to adhere to these ASTM standards. They have been developed with rigor, as are all ASTM standards; specifiers should satisfy themselves that a selected ACB manufacturer can show documented adherence to these standards, including actual testing results and Factor of Safety calculations for design conditions. 1. Dam embankments potentially subject to overtopping flow require protection against erosion that might lead to failure. 2. ACB systems can be an effective and economical way to protect embankments from erosion due to overtopping flows. 3. ACB design and block selection requires understanding overtopping flows for a structure, using the Factor of Safety calculation to determine the appropriate size ACB for protection and ensuring the system meets performance requirements. Other considerations should include armoring for hydraulic jumps, drainage layers under the block and appropriate mat perimeter protection. 4. ASTM standards define testing of ACB systems. Specifiers and reviewers should ensure the selected ACB system has testing documents to substantiate the system’s Critical Shear Stress at 0°, so the Factor of Safety can be calculated with confidence. Bridge Scour and Stream Instability Countermeasures, Third Edition, Hydraulic Engineering Circular No. 23, FHWA-NHI-09-111, Washington, D.C., 2009. Clopper, P.E., and Chen, Y.H., 1988. “Minimizing Embankment Damage During Overtopping Flow,” FHWA Report No. FHWA-RD-88/181. Powledge, G.R., Ralson, D.C., Miller, P., Chen, Y.H., Clopper, P.E., and Temple, D.M., 1989. “Mechanics of Overflow Erosion on Embankments II: Hydraulic and Design Considerations,” Report of the ASCE Task Committee on the Mechanics of Overflow Erosion on Embankments, Journal of Hydraulic Engineering, ASCE, Vol. 115, No. 8. “Standard Test Method for Performance Testing of Articulating Concrete Block (ACB) Systems for Hydraulic Stability in Open Channel Flow,” ASTM D7277-16, 2016. ASTM International, 2016. Registration on v1-education.com is required to access the quiz. v1-education.com to register. If you are already registered simply enter your credentials to access the quiz.